MAB’s latest residential triumph, The Quays, has taken out a series of highly coveted design and architecture awards and opened its doors to the public as part of Open House Melbourne on 26 and 27 July. Envisioned by MAB and designed by architects McBride Charles Ryan, The Quays won the Marion Mahony Award for Interior Architecture and the Residential Architecture â€“ Multiple Housing Award at the 2014 Victorian Architecture Awards. MAB Residential General Manager David Allt-Graham said the collaboration between developer and architect has resulted in The Quays outstanding success. “MAB wanted to challenge the status quo with this project. When combined with the creativity and ingenuity of celebrated architects, MCR, a great collaboration was formed,” said Mr Allt-Graham. “Recognition at this level is a real compliment and validates the vision we had for The Quays. It’s incredible to have seen this vision come to fruition and to now see it celebrated,” he said. 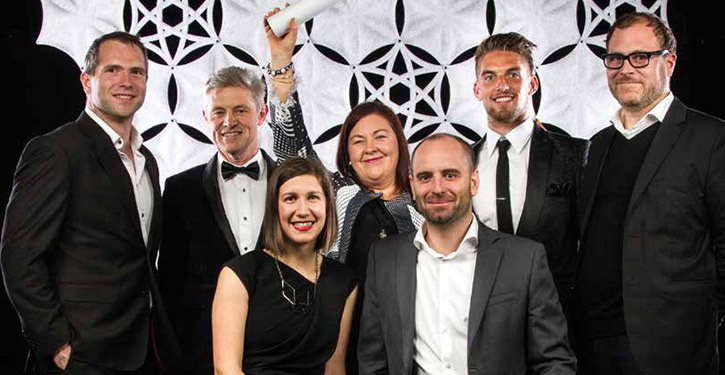 At the recent 2014 Dulux Colour Awards, The Quays not only won the Multi Residential Interior and Exterior categories, but also took home the night’s highest honour, the Grand Prix. “The exterior of The Quays is a bold, yet considerate use of colour. The apartment building stands out amongst the high rise corporate buildings in the Docklands and can be seen as an oversized public art space. Just like the exterior, the interior of The Quays continues to embrace colour, from hot colours in shared spaces to the muted tones in the pool and spa areas,” the judging panel said. MAB Chief Operating Officer David Hall said The Quays is MAB’s most visionary residential development to date and has been an inspirational journey for everyone involved. “It’s been a privilege to bring such an iconic, award-winning local new landmark to the Docklands community,” said Mr Hall. The Quays opened to the public in July as part of Open House Melbourne. Tours incorporated the building’s public spaces including pool, residents’ lounge and rooftop garden, along with a viewing of artwork located in the South Tower lobby.